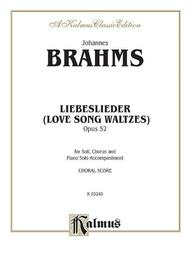 Love Song Waltzes (Liebeslieder Waltzes), Op. 52 (SATB (German, English Language Edition)). Composed by Johannes Brahms (1833-1897). Choir Secular. SATB choir. Choral Extended Work; Larger Works; Masterworks. Kalmus Edition. Masterwork; Romantic; Secular. Book. 32 pages. Published by Kalmus Classic Edition (AP.K03249).ISBN 0769244327. Masterwork; Romantic; Secular.